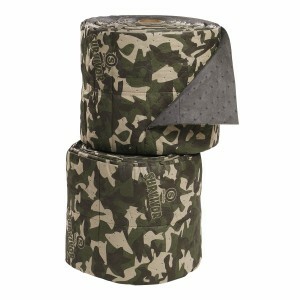 Rugged SurvivorSeries™ Mat Rolls are strong for your toughest jobs. They survive the punishment of everyday wear and tear. This innovative Mat features a SpunBond top layer that wicks liquids away into the MeltBlown core where it is trapped to keep the Mat and floors safe and dry. The bottom layer is built of densely woven strands of FineFiber to increase surface area, enabling the Mat to grip the floor and securing it for safer walking. All layers are ultrasonically bonded together for durability and resistance to wear in high traffic areas. Strong and long-wearing, SurvivorSeries™ Mat stays on the job so you use less and save money! Made using SpillTech's innovative StealthTechnology, the top camouflage layer hides leaks and drips of oils, water or solvents. It also stays clean and dry, so you don't have to replace the Mat as often — and that saves you money! Absorbs high volumes of liquid fast. Rolls are perfed every 7.5" vertically and every 17" horizontally.